Some people are naturally good at trash talking, while others might struggle to come up with good insults. 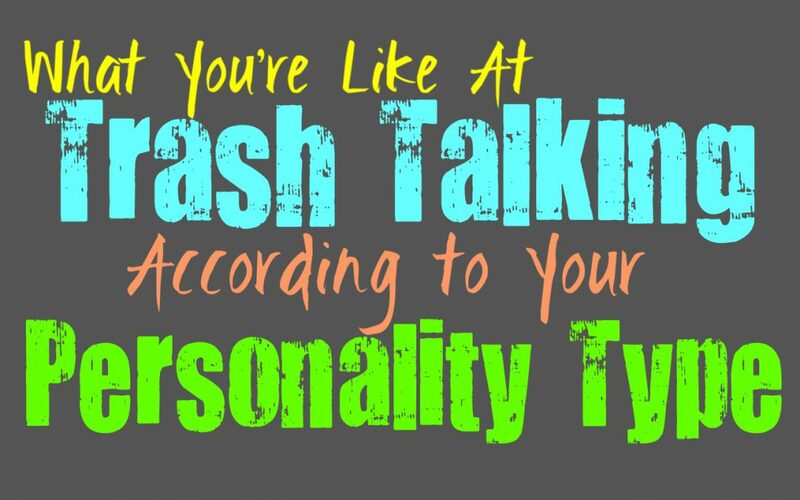 Here is how good you are as a trash talker, based on your personality type. INFJs aren’t usually fans of trash talking people, and might find this to be a bit obnoxious. INFJs are often better at playfully talking smack to one of their loved ones, in a way that won’t actually hurt the person they are talking about. This isn’t about being insincere or gossipy, they would only do this with someone they trust completely. INFJs can have truly sharp words if they want to, and so trash talking can feel a bit pointless to them when the intention is just to mess with someone a bit. ENFJs aren’t really fans of trash talking most of the time, since they are all or nothing with their words. They are either kind to someone or they can be rather vicious when they need to be. ENFJs might find it to be a bit foolish to trash talk someone, especially in a situation where it is simply because they are being competitive. They often prefer to win and prove their worth by being better than someone else. This doesn’t mean they are incapable of trash talking though, since ENFJs often know the exact words to say in order to tear someone down. INFPs can actually be pretty good at trash talking, especially if they are just doing it for fun. They are playful people who enjoy pushing the limits sometimes, but they will try to avoid going too far. INFPs don’t want to truly hurt people with their trash talking, especially if it is simply done in a competitive manner. They are good at coming up with quick insults most of the time, and have rather witty vocabulary. For the INFP it entirely depends on the situation and what is calls for, but trash talking is something they can actually be good at. ENFPs can actually be great trash talkers when they want to be, especially if they are being a bit playful. They might even enjoy being able to push someone’s buttons in order to see how far they can take it. ENFPs are good at coming up with ways to annoy or agitate people, and can certainly be great trash talkers because of it. They can often come up with just the right words to say in order to frustrate someone and get them off of their game, since they are usually rather good with words. INTJs aren’t afraid of trash talking and might even enjoy it from time to time. They can be truly competitive people when they need to be, and aren’t afraid of using their words as a means of making someone back of. Most of the time INTJs are more than capable of getting things done without having to trash talk people, but they are certainly good at it when they need to be. If they feel the desire to really get into trash talking with someone over competition, the INTJ often knows exactly what to say in order to cut someone down. ENTJs might enjoy a little trash talking from time to time, especially in a playful manner. They can be competitive people and sometimes trash talking just comes with the territory. They know how to express some sharp words when they need to, and this can really cut people down a bit. ENTJs usually like to allow their accomplishments to speak for themselves, but when the setting calls for trash talking they aren’t afraid to step up. INTPs don’t usually like trash talking since it means having to deal with people more than they are comfortable with. They do have moments where they might feel the need to interject, and in these situations they can be great at trash talking. While it isn’t something they normally strive to engage in, INTPs often know exactly what to say in order to get underneath someone’s skin. They can figure out which words will really cut and make that person take a step back. ENTPs can be great trash talkers, sometimes they do this just to see how people will respond. They are great at pushing other people’s buttons and might even enjoy doing it. For ENTPs it is often about observing a situation and reading how people respond to what is going on. They are often great trash talkers since they figure out unique and creative ways in order to get underneath other people’s skins. They are intense and outgoing people, who usually want to make things fun and enjoyable, but that doesn’t mean they can’t engage in a little playful trash talking. ISTJs aren’t usually fans of trash talkers, and can find this behavior to be a bit annoying. ISTJs would rather focus on being efficient and don’t like when someone feels the need to challenge them verbally. They work hard to show their skills by simply being better than someone else, not by talking smack to them. ISTJs aren’t afraid of trash talking if they have to, but in most situations this seems childish and completely pointless. ESTJs aren’t usually trash talkers, instead they are direct and firm with how they express themselves. If they are in a competition with someone they often allow their skills to prove that they are better than someone else. If someone does challenge the ESTJ they aren’t afraid of expressing themselves, but they can be a bit more aggressive and direct than someone who is just trash talking towards them. ISFJs aren’t usually fans of trash talking, especially if it comes across as mean or hurtful. They don’t like upsetting people and because of this they are often gracious as winners or as losers. ISFJs work hard to be the best at things, but that doesn’t mean they have to shame people or talk trash to them for what feels like no reason. They often try to make others feel good even when they are failing at something, instead of talking down to them. ESFJs don’t usually like trash talking, especially when it seems to go a bit too far. If their words are hurtful to others it will make the ESFJ feel bad about this, and so they try to avoid this behavior entirely. ESFJs can become truly upset if something they say causes someone else pain, so they certainly try to avoid this. If there is a situation where trash talking clearly won’t hurt someone’s feelings, then the ESFJ might enjoy getting into a bit. ISTPs don’t mind trash talking a bit, especially if it is done in a competitive manner. They are often good at coming up with the right things to say in order to get underneath someone’s skin. Most of the time ISTPs try to avoid drama and don’t like doing anything that will make them have to interact with someone in a way that will drain them. At the same time they have moments where they might engage with someone and they are more than capable of skillfully trash talking. ESTPs are definitely capable of trash talking, especially in a situation where it is called for. They don’t mind getting into with someone, as long as it is done in a playful manner. They do have a hard time with more serious trash talking and can actually become deeply hurt with what someone says. For the ESTP it depends on the situation and what they are really interacting for. If they are in a competitive situation which calls for trash talking, then they are more than capable of doing this. ISFPs don’t usually enjoy trash talking and can find it to be a bit pointless. For them it feels draining to have to come up with insults for people, especially in a competitive setting. They want to be open and honest but they don’t want to do things that might hurt others. For the ISFP words are important and so sometimes trash talking can just seem cruel and hurtful to them. They enjoy being playful with their loved ones, but they don’t want this to go too far. ESFPs can be playful and competitive, and are capable of trash talking in certain situations. For them it is easier to trash talk to strangers or people they feel are challenging them in some way. They can certainly trash talk a bit, but they don’t want to do anything that might be too hurtful. ESFPs are good at finding that line and can certainly have a way of pushing people’s buttons without really making it obvious or harmful.